2- How to - AllerData - le site de l'allergologie moléculaire. 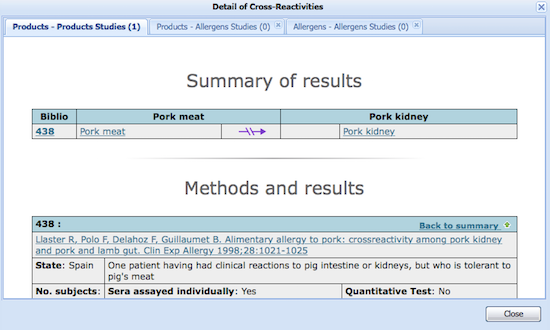 Allerdata is a web-based tool designed to guide the understanding of the relationship between various allergens. 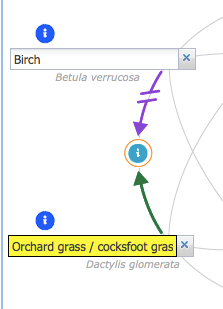 One main feature is the possibility to call up various allergen sources (cat, birch, etc.) and access from there clinically validated links as well as their finer definition via molecular allergy/component resolved diagnosis. A complete molecular allergy documentation (in french :-( ) further assists the user in grasping what is, in allergy practice, a revolution comparable to the discovery of house dust mites in the 1960’s. The Search tool divides into 4 zones. If many items are proposed, a navigation bar will appear on the right of the list to go down further. It is then preferable to add one or 2 more letters to find the item you are searching for. When you choices are entered, click on “confirm” (usually “confirming” will not be necessary as the pentagram searches for links as each field entry is completed. Pressing “Confirm”, if you are in doubt, will ascertain that the data processing has been completed thoroughly). No arrows showing up means that there is no study in the database to support a link or the absence of a link between the 2 items. 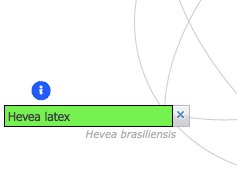 If a cross-reactivity link of one item towards the other is represented in all the studies of the database : a solid green arrow highlights it. A dashed red arrow shows that some studies have reported a link but that at least one study concluded as to the absence of cross-reactivity. 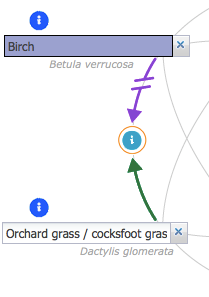 A broken purple arrow shows that cross-reactivity between the items has been reviewed but that all the studies presently in the database conclude to the absence of cross-reactivity. A clic on the “i” (information) in the circle at the end of the arrow shows the list of studies from the database addressing the corresponding cross-reactivity : What they are, where they have been completed, by whom, on how many patients. Clinical data taken into account ? Were mixed (pooled) sera used ? Were the tests quantitative (RAST inhibition, CAP or ELISA) or qualitative (Immunoblot inhibition) ? It documents the molecular families involved in the search and refers to their main features (further documented by following the “i” circle that follows the name of the molecular family. For example : LTP’s are not heat labile but profilins are. A click on the molecular family name show on the pentagram their presence in the corresponding items with a change of color to yellow of the data entry field(s), this for 5 seconds. A “representative” biologic test, or many, may be proposed. The clinician must choose on the basis of local realities the most appropriate test. Reading the documentation will assist in this regard. This zone is on the bottom right. The presence of CCD’s (cross-reactive carbohydrate determinants), source of possible false positives is notified by a 5 second period of green highlighting of the data entry field when a CCD containing product is selected. Each item selected may, potentially, cross-react with other elements of the database. The zone on the right provides a list of related items with the number of products identified. An exhaustive review, dutifully created by allergists with keen knowledge of molecular allergy, the synoptic documentation aims to facilitate the understanding of cross-reactivity mechanisms and further competence of clinical use of this science. All articles are made accessible, not through the search tool but rather directly from the homepage or from the search engine (upper right on the site’s webpages). Once logged in, a “Bookmarks” menu will appear next to the “Info” and “Search tool” tabs : a click will take you from there to articles you wish to read at your leisure later on. Or delete it directly from your “Bookmarks” page (cf. above). The printing process has also been reviewed : if you print an article, you will not have the bibliography (let’s save the planet !) but you can still print it separately by clicking “Print the bibliography” at the bottom of the article.